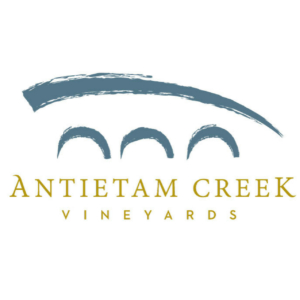 The newest vineyard in Washington County is right here in Sharpsburg – Antietam Creek Vineyards! 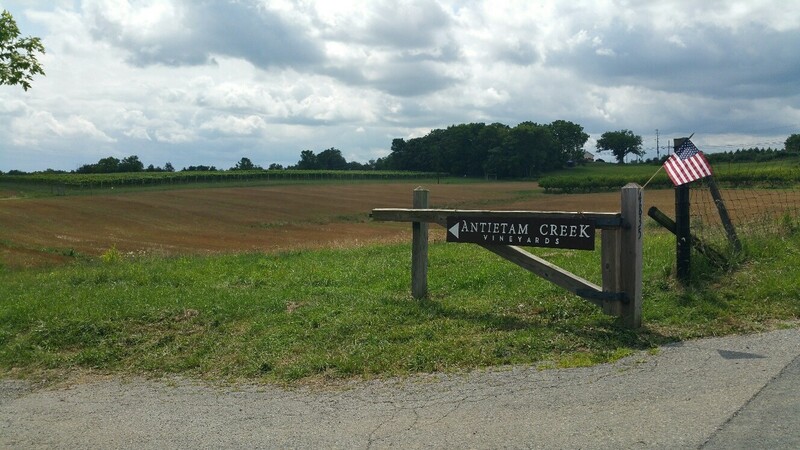 This 55-acre farm is adjacent to the Antietam National Battlefield and the grapes are grown, processed, aged, and blended at the vineyard. Antietam Creek Vineyards (ACV) is owned and operated by Joan Larrea and George Warmenhoven. 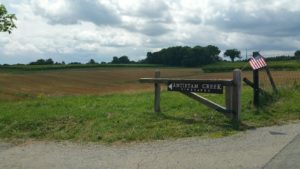 Since 2008, these world travelers have been working to turn this former 55-acre dairy farm into a vineyard. 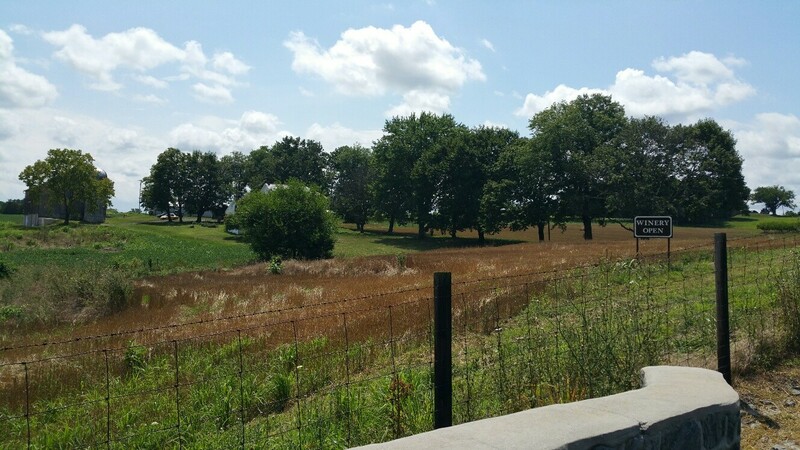 In 2011 George planted their first 4 1/2 acres. By 2015, the grapevines had reached full production and this husband and wife duo began retrofitting their 100 year old barn into a tasting room. 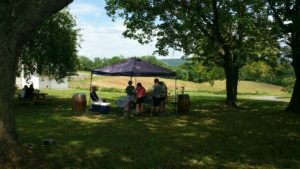 The next year, George’s dream of opening a winery came true and they opened to the public in August 2016 for weekend tastings. 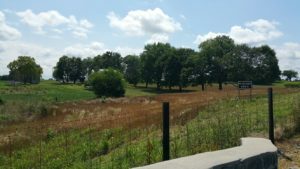 While visiting this area and staying at the Inn, one of the first things guests notice are all the limestone outcroppings. 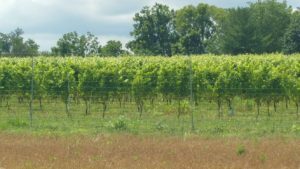 Of course they ask, “How in the world can anyone farm here, let alone have a vineyard?” Well it turns out that the limestone and the soil here are perfect for making wine. According to ACV the limestone in the soil provides “a perfect 7.0 pH, or neutral acidity. In doing so, it imparts “terroir,” or place-specific taste elements, to our wine. In our whites, it is expressed as flintiness and freshness. In our reds, it allows the varietal fruit flavors to come through cleanly“. After harvesting, the processing and fermentation takes place in the cool cellar of the barn. Each varietal is aged in either French oak barrels or stainless steel to preserve and enhance the best features of each wine. The stone cellar of the barn also makes a great location to store each bottle at the perfect temperature. Their Tasting Room is in the 1903 bank barn that George and Joan are hoping to have completed soon. 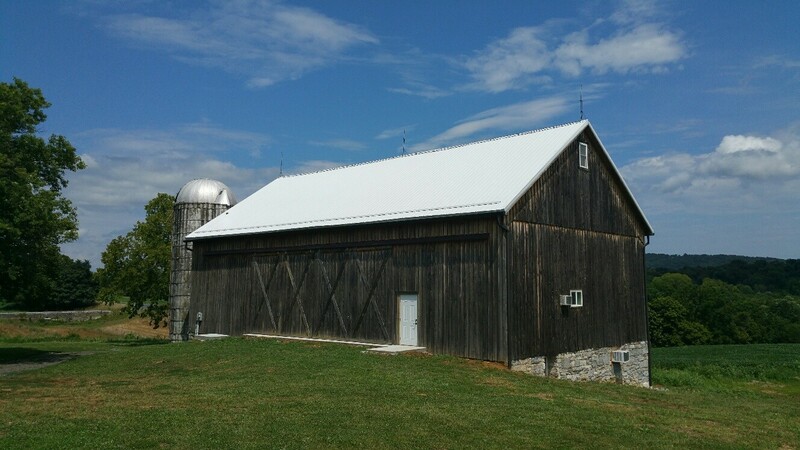 The chestnut post and beam tasting room is a perfect setting to enjoy this local hand-crafted wine while viewing the pristine Antietam landscape. Until the barn is completed, you can enjoy the wines on the grounds, under the tent or at the picnic tables. Feel free to bring a lunch or some snacks to accompany the wine. Tastings will be held from April through November, on Saturdays and Sundays from 1-6pm. Joan & George holding an outdoor tasting.